After 17 years of business, Imperx has proudly become an expert in the digital imaging industry. Every year, we combine our technological innovations, expertise, and experiences at international trade show exhibitions to create new and exciting content to share with our customer and distributor base as well as our social media followers and YouTube subscribers. Check out our exciting video library containing our product line videos, ON-SITE, LIVE trade show interviews and user-friendly “How-To” tutorials. Our exclusive webinars provide exceedingly valuable knowledge and registration is completely FREE but going fast! Click below to register now. Have any questions? Contact us at 561-989-0006 or [email protected]. We proudly introduce our new Tiger series of cameras to our line of advanced digital CCD cameras. Head of Business Development at Imperx, Nathan Cohen, talks us through the latest Puma, Tiger and Cheetah camera range and their incredible versatility. Imperx is excited to add 10GigE to our extensive array of product offerings. Stay tuned to find out more information, or sign up for our Company Newsletter to be receive important Imperx notifications. IMPERX PATENTED EtherNet/IP™ Process Video Recorder (EIPVR) is an event recording system that captures high speed video when you need it. 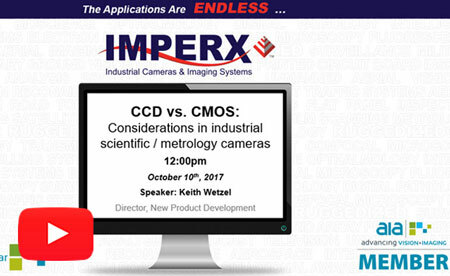 See the high-speed demonstration of the IMPERX C5180 performing in license tag recognition. Nathan Cohen, head of North America Business Development, fills us in on our latest additions to the Cheetah, Puma, and Tiger camera series. Enjoy a sneak peek at our EXCLUSIVE Imperx video compilation for exhibitions. When it comes to getting great images, Imperx cameras provide the tools to make that happen. Watch how to use automatic exposure control, automatic gain control, and gamma control. Watch to learn how to adjust your white balance to achieve color accuracy and stability. Imperx is committed to quality assurance in everything we do. Imperx, a leading designer of Ruggedized and Industrial cameras worldwide, presents our new animated logo.